Hope everyone had a wonderful Christmas. I take this time to thank you all for your good wishes for a speedy recovery. I am on the mend and happy to be back…the heck with the pain…I need to cook and post. I miss it, its in my blood. I did a few dishes since my accident. 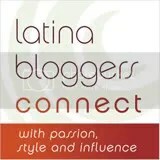 Had two wonderful bloggers visit me; one from Puerto Rico and the other from Argentina. I will wait until after the holidays to write about the time spent with them. Deceided to have a few friends over for dinner on the 23rd. It started with 4 and ended up being 13. My husband always complains that I make too much food and he has to eat the left overs, this time it worked out well. There is a show on the Cooking Channel which I fell in love with, French Cooking at Home. The host is Laura Calder. She is funny, witty and charming. Makes everything look so easy and now I am a devoted follower. When I saw her prepare this dish, I knew I had to make it. It is elegant and delicious. 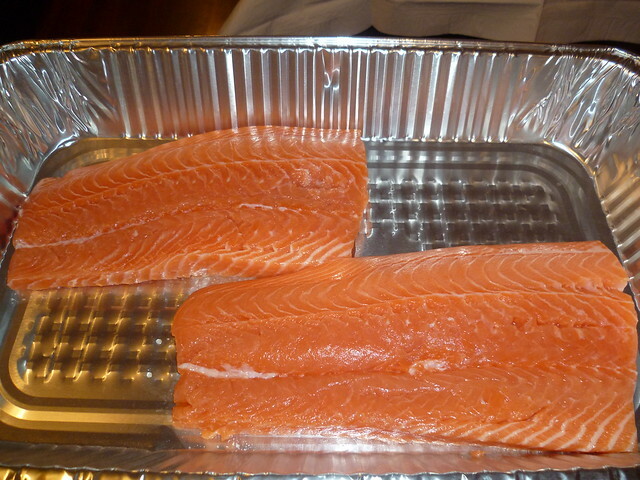 2 pieces of Salmon (play with the ingredients and quantity of salmon. It all depends on how many you are feeding). After cutting off the tips of asparagus, blanch and then shock them in cold water. Put them in your food processor and pulse a few times, then add to your crème fraîche with the juice and zest of the lemon. Mix well and season with salt and pepper. No words are needed here. 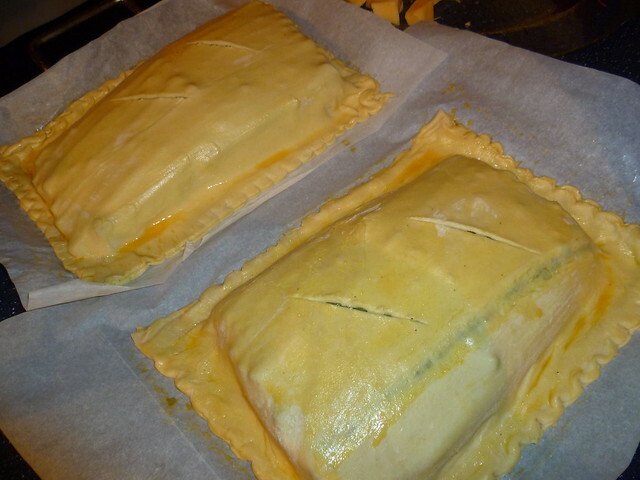 Make two slits on top of puff pastry to let steam out. Just make sure your oven is set at 425 degrees and bake for about 20 minutes or until pastry is puffed and golden. 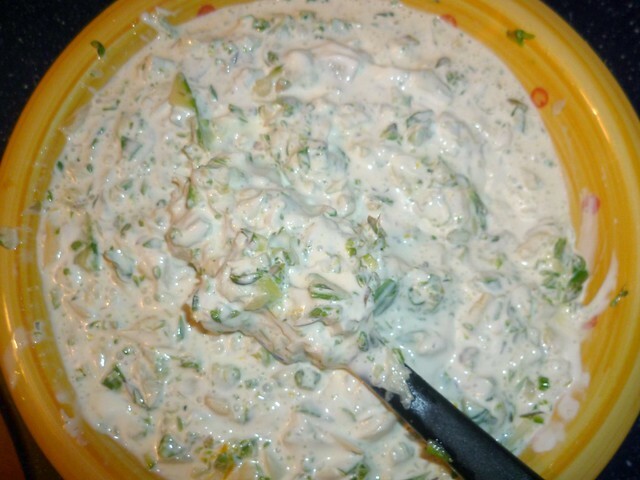 Serve with left over creme freiche. BON APPETIT – BUEN PROVECHO! This entry was posted in Appetizers, Breakfast/Brunch, French, Holidays, International Dishes, Seafood, Something Different, Uncategorized. Bookmark the permalink. Beautiful and oh so elegant, Norma! I hope your Christmas was grand! 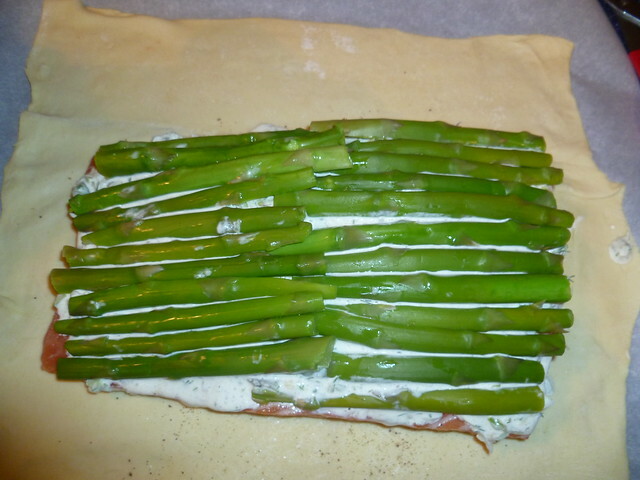 This looks so tasty and a perfect dish for a holiday supper. I’m not aware of Laura Calder or her program, but I’ll keep an eye for it. Thanks for the introduction. Yum!!!!!! 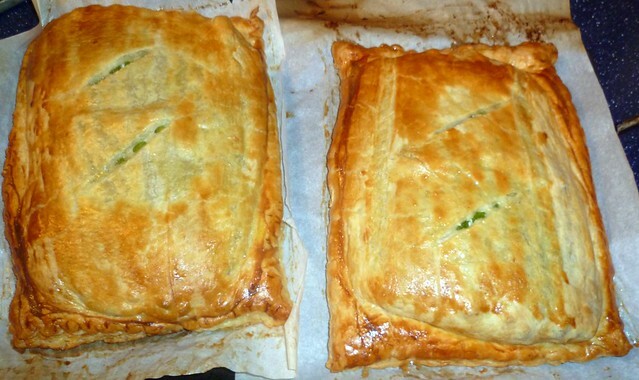 I did beef wellington, which is kind of similar! Beef topped with mushrooms and wrapped in puff pastry. 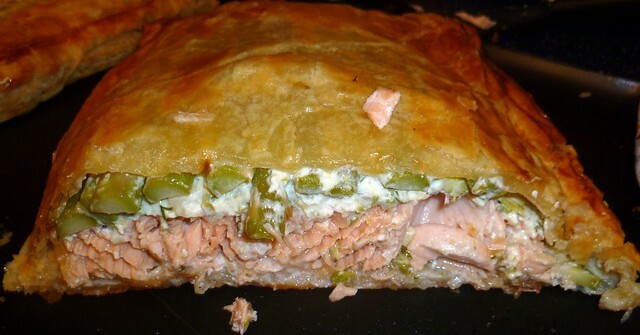 I will DEFINITELY try salmon en croute! glad to hear you are recovering well. 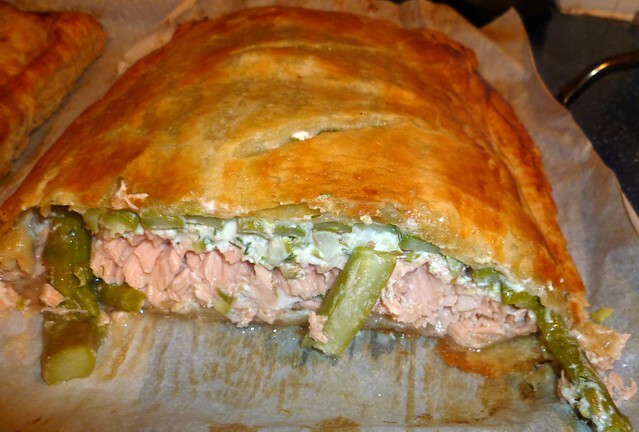 Your salmon en croute looks delicious. Happy Holidays and Happy New Year! Wow. Delicious looking. 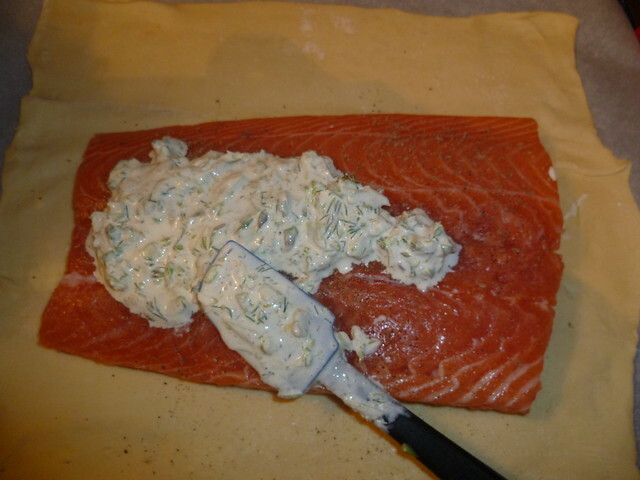 I have wanted to make salmon this way forever. So glad you got to have nice visits with bloggers. Happy Holidays and cheers of good food and wine to a great new year. Norma, this salmon looks terrific…!!! 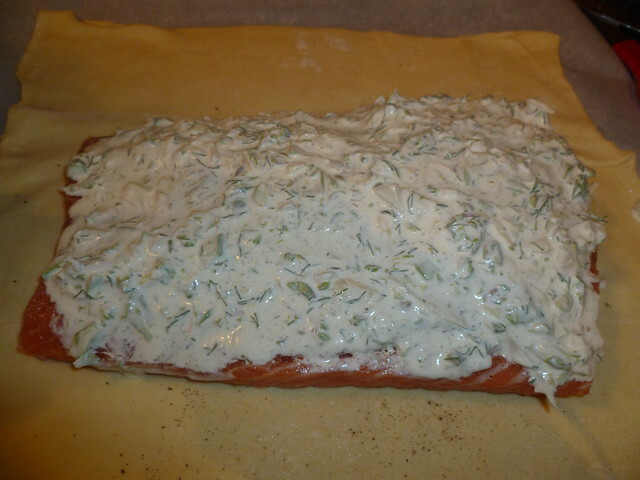 My husband loves salmon, my kids don’t, by I don0t care…!!! I dare say..food for the gods! Absolutely scrumptious Norma! So glad you are back to cooking! This is absolutely calling my name right now – it looks wonderfully delicious! I need to get the cooking channel. Sie eine erstaunliche Blog hier! würden Sie es vorziehen, einige laden Beitr?ge auf meinem Blog zu machen? esto luce sabroso me encanta el salmón,abrazos y feliz año 2012 lleno de alegrías,abrazos y abrazos. That dish looks amazing,Norma!Feliz Año nuevo!!! I have eatenat Norma’s house many times and this was THE most delicious meal she has ever made. This Salmon was so delicious I could not stop eating it. Kudos to Norma for this great meal and a great time at her house. That is a gorgeous idea for any party! Thanks Normita!! What a wonderful dish for Christmas dinner! Happy New Year! Glad to hear you are on the mend! I had the pleasure of dining at Norma’s house right before the holidays, and I can say, without reservation, that she is a fantastic cook! This dish looks amazing, Norma. I really like salmon, but it’s hard to find and/or expensive here in Argentina. I’ll live vicariously through this post! Mmhhh, delicious! A great Winter dish. This is my second year making this dish for New Years Day. We love it! Thank yoou Kat its one of my favorites…Happy New Year!